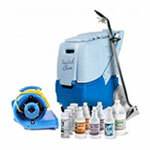 This commercial carpet cleaning package from Trusted Clean comes with everything you could possibly need! The heated box extractor draws too much power for a single power cord, so it comes with two 50' power cords. Each one needs to be plugged into a separate outlet on different circuits. A circuit locator is included for you to test this out before you start cleaning. The heat helps to clean the carpets deep down to pull all of the debris from deep within the carpet fibers. If you do not have 2 separate outlets available for your job, do not worry, you can simply remove the heater and use the machine as a non-heated extractor. A 3 speed air mover is also included in this great package to help quickly dry the carpets in your commercial settings. Most jobs are done over the evening, and then multiple fans are left in place in ensure a dry carpet in the morning. The chemicals included will fill the machine about 10 times, and help to remove stains in the most soiled regions. A stainless steel stair tool is also included for cleaning those hard to reach areas, like stairs and corners. You can also use this hand tool to extend your services to upholstery and chair cleaning, as well as normal commercial carpet care. Please feel free to take a look at our complete line of carpet cleaning packages, if this heated extractor package is not exactly what you're looking for.